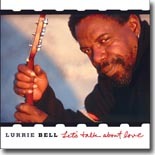 Two of our reviewers liked Lurrie Bell's new CD, Let's Talk About Love, so much that it was an easy choice for this month's Pick Hit. The Surprise pick this month features the rural Hill Country blues of Moreland & Arbuckle. Their new CD, 1861, is our Surprise CD of the month. The fantastic debut album from 1986, Cold Is The Night, from the Bay Area's Joe Louis Walker, is this month's Flashback feature. Our What's New section features new releases from Alvin Jett, John-Alex Mason, Catherine Russell, Tom Principato, Cash McCall, Barbara Blue, and more, plus reviews of DVDs from Son Seals and Eddy Clearwater.